As you may be aware, claims that copper jewellery are able to help with arthritis are relatively common, although the evidence is pretty negative. The claim about magnets attracting iron in your blood and thereby increasing circulation is pure pseudoscience though. Usually, if I do something about an ad like this, I lay a complaint directly with the Advertising Standards Authority. This time though, I thought I’d try directly contacting the store to see if they’d fix this situation without requiring any regulatory intervention. I understand that these claims were likely supplied to [your store] by the supplier of the copper and magnetic jewellery, and that no one at [your store] has had any intention of misleading your customers. 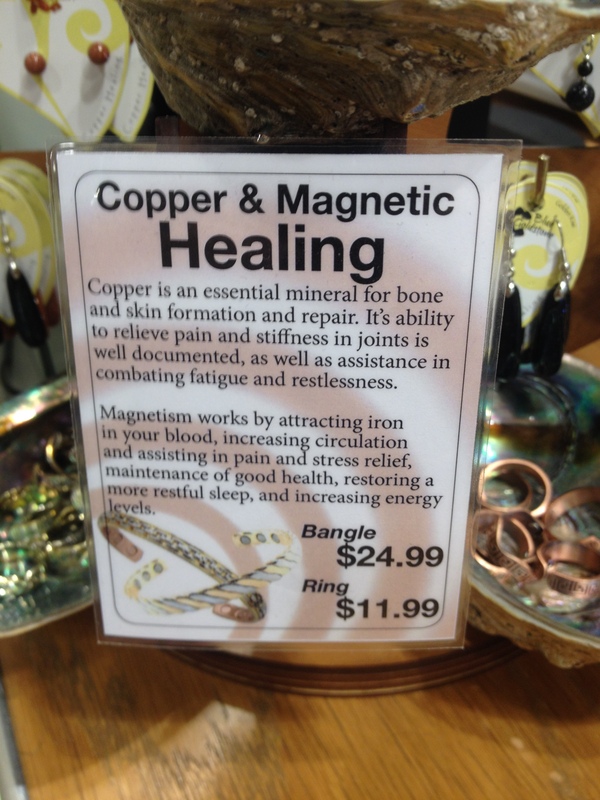 I recommend that you immediately remove the “Copper & Magnetic Healing” display, and contact the manufacturer to ask them for evidence to substantiate these claims. Unless you are in possession of such evidence, you should avoid making therapeutic claims regarding these products. I’ve had a wide variety of responses from my ASA complaints in the past, so I wasn’t sure how I should expect this business to respond. To make sure my email wouldn’t just be ignored, I asked them to get back to me within a week to let me know what they’d do, so I could know whether or not I should complain to the ASA. In this case, I was very impressed to hear back from them the next day to tell me that the stores had been advised to remove the displays and they would contact their supplier to ask for evidence to substantiate the claims they’d provided. They also seemed to realise that the chance of the supplier being able to give the kind of evidence required was pretty slim. A couple of days after that, I heard back from them again to confirm that, as expected, their supplier was unable to provide evidence that would substantiate the claims made about the jewellery. Because of this, they told me that from now on they would only advertise them as jewellery – not “healing jewellery” or anything like that. I’m very happy to have seen such prompt and responsible action taking following a complaint. I hope this can serve as an example to other businesses. If you see a therapeutic claim advertised somewhere, and you think it might not be backed up appropriately by scientific evidence, perhaps consider doing something about it. A good start could be to just ask for evidence. If you’d like them to remove a claim if it turns out not to be backed up by evidence, you can recommend that they do this (and your recommendation will be backed up by the Fair Trading Act). If they refuse, which I would hope is unlikely, then you could lay a complaint with the ASA. The ASA requires that advertisers must be able to substantiate therapeutic claims that they make; it’s not up to you to prove them false, it’s up to advertisers to prove them correct. Be polite. This costs you nothing, and if you come across as rude or antagonistic it’s not going to lead to a productive exchange. Recommend a course of action. Ideally make it something that is easy for the business to do. Give an ultimatum. This should still be polite, but I would recommend asking the business to tell you what they’re going to do within a certain timeframe (such as one week) so you’ll know whether or not it’s necessary to bring their claim to the attention of the Advertising Standards Authority. If you’re interested in doing something about a dodgy medical claim, the Society for Science Based Healthcare can help you to understand the regulation and put together a complaint. I was in [your store] earlier today, and I noticed a display for copper and magnetic bangles and rings on the counter (see photograph attached). This display contained a number of therapeutic claims about the products. As I hope you are aware, the Advertising Standards Authority requires that all therapeutic claims made in advertisements must be truthful and have been substantiated (see their Therapeutic Products Advertising Code Principle 2). Similarly, the Fair Trading Act 1986 Section 12A states that unsubstantiated representations must not be made in trade. To my knowledge, none of the therapeutic claims made on the display are substantiated. The Advertising Standards Authority upheld a complaint in 2013 against claims made on the Woolrest Biomag website, partly due to the fact that their claims that the magnets in their products can increase circulation by “drawing trace elements, for instance, iron, towards the magnets” and by causing “blood vessels to dilate” did not appear to be supported by any evidence and were therefore likely to mislead consumers. Please reply to this email by the 23rd of November to inform me of what action you will be taking, so I will know whether or not it will be necessary for me to lay a complaint to the Advertising Standards Authority to settle this matter.